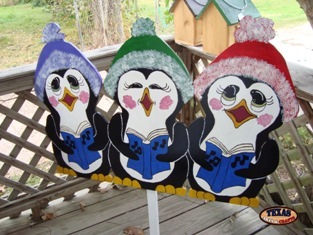 The Choir Penguins yard art is made in our workshop. There are three black and white penguins, they each have a different color hat: purple, green, and red. The penguins each have a blue choir book. The dimensions are approximately 27.50 inches tall by 42 inches wide by 2 inches deep. This piece weighs approximately 15 pounds. For the continental U.S. shipping and handling is included in the listed price. For shipping outside the continental U.S. please contact us through our Contact Us page.